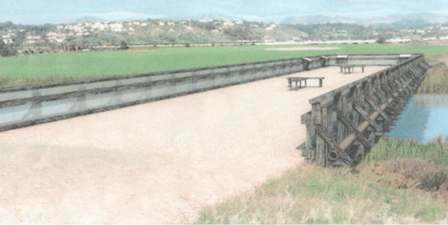 The Grand Avenue Bridge was slated for demolition as part of the restoration of the San Dieguito Lagoon. However, members of the Friends of the San Dieguito River Valley proposed the bridge to be repurposed as a wetland viewing overlook. The Bridge was once the means to drive onto the former “Airfield Property” just north of the existing lagoon, west of I-5. With the San Dieguito Coastal Wetland Restoration Project, the bridge was used for construction access to the deep lagoon on the west side of I-5. After the completion of construction, the northernmost two spans of the bridge were demolished, leaving the partial bridge structure as viewing overlook. The reuse of the historic bridge was funded by a generous grant from County Supervisor Pam Slater-Price, and labor and materials were funded by Southern California Edison. Volunteers from the Rotary Club of Del Mar provided significant assistance in treating and staining new wood for the railings so that they blend in with the original wood railings.